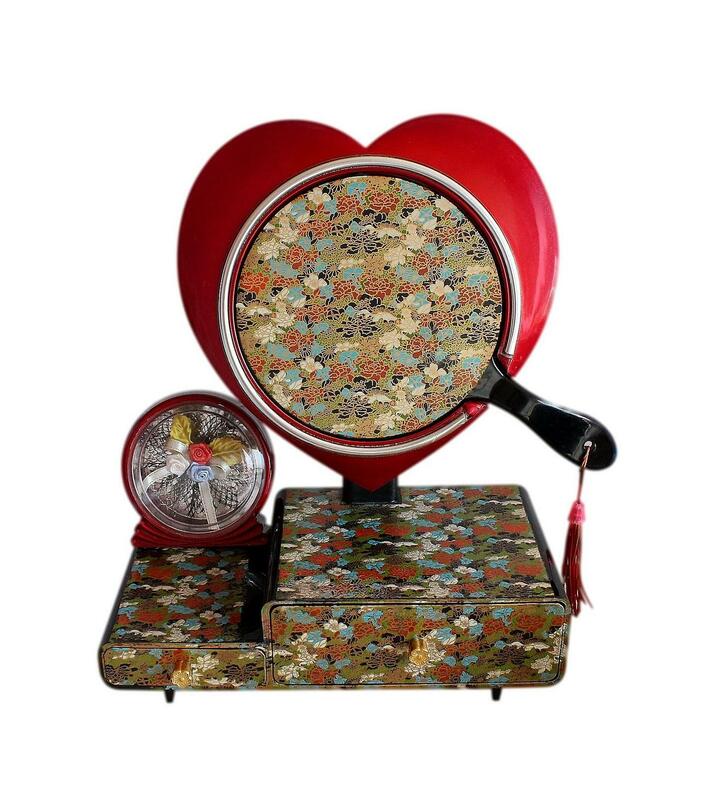 This is a beautiful kitsch Japanese vintage jewellery box, dating to the 1980s. 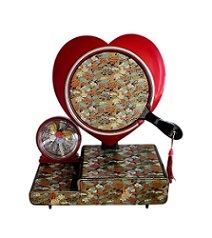 The box has a striking large heart at the top which has a beautiful deep red vitreous enamel finish. 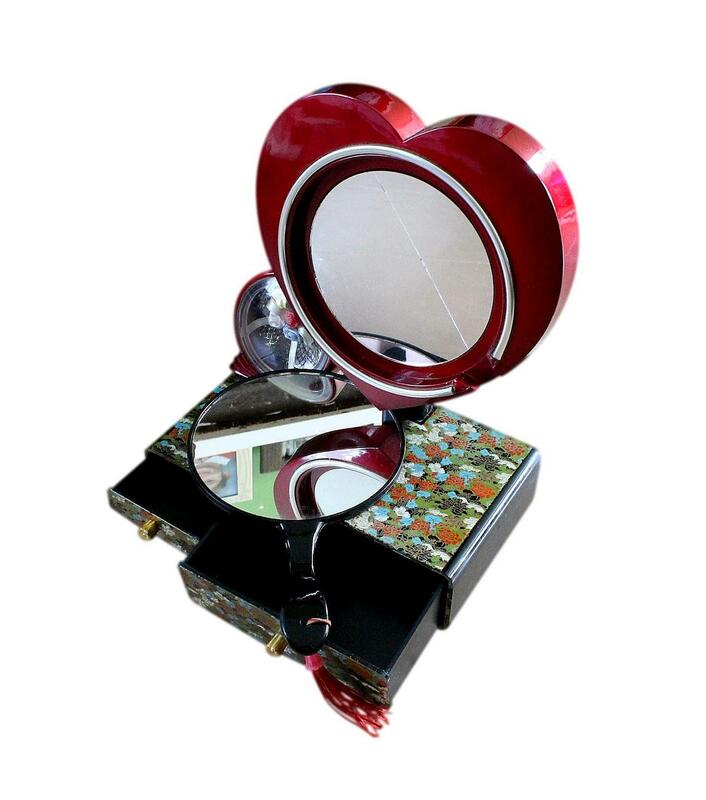 Held within the heart is a large hand mirror and behind this is a further large mirror. 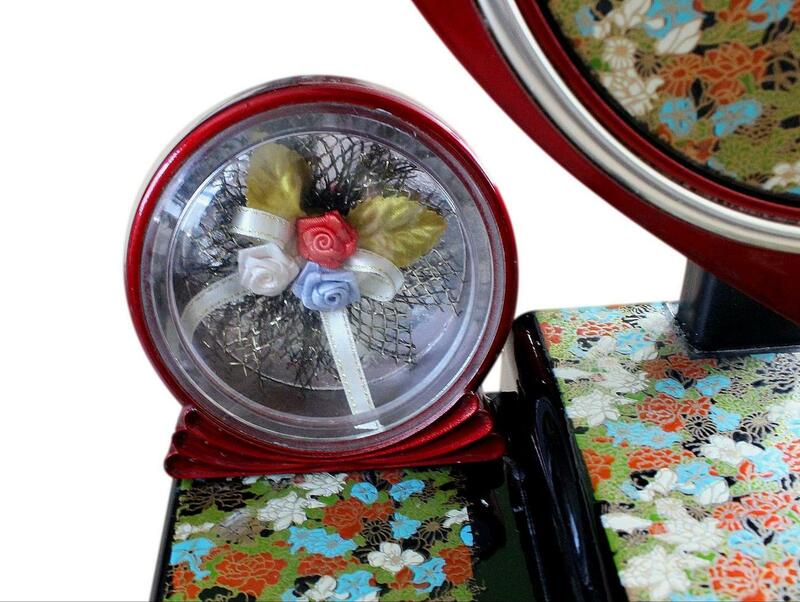 The hand mirror has a black enamel finish and its back has beautiful turqouise, white, orange and green, flowers and leaves. These all have beautiful gold highlights. 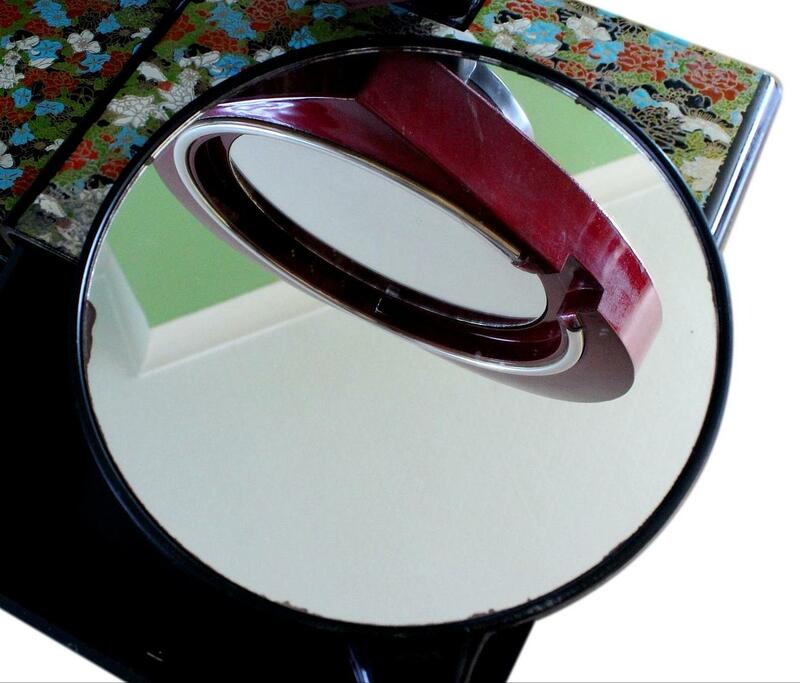 The mirror is complete with its original tassell. 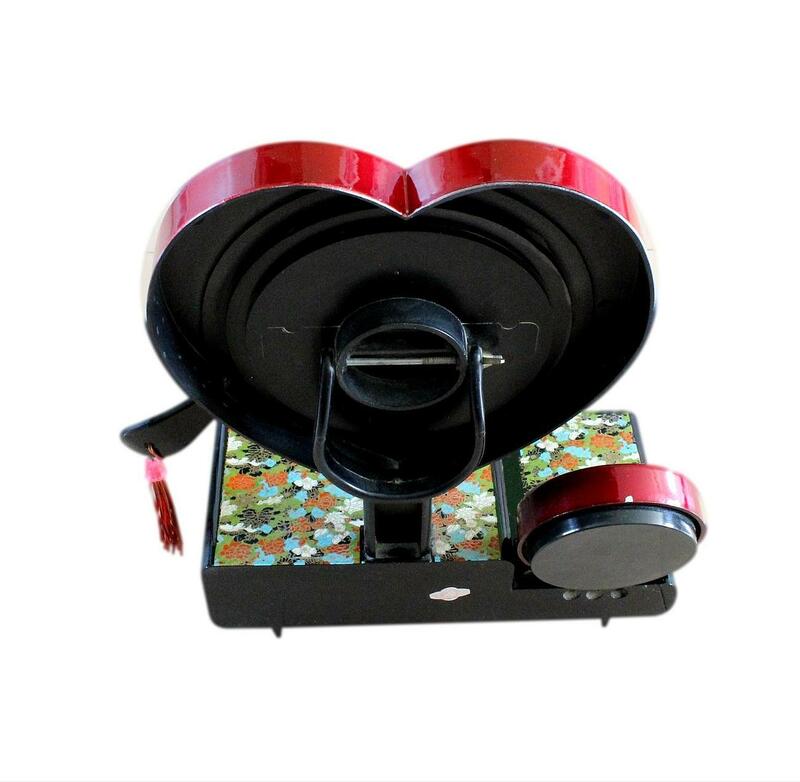 The heart can be moved backwards and forwards, allowing the mirror to be positioned at different angles. The bottom section of the box has a stepped design and two different sized drawers. 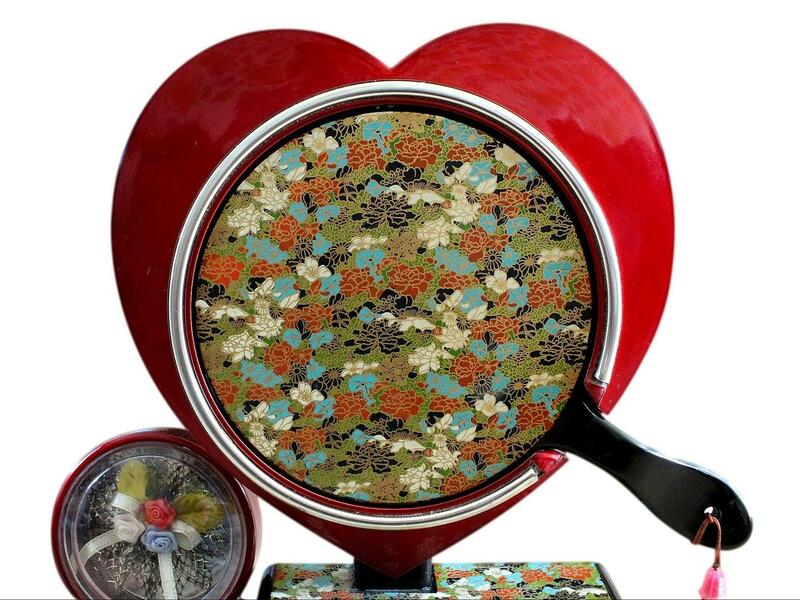 This section has the same floral decoration as the hand mirror, the only difference being that it has a textured finish. On top of the lower drawer is a decorative cased feature with folded ribbon detail. This has a display of pretty satin flowers and ribbons within it. The drawers have decorative gold handles. The entire box is made of durable plastic. It is in very good vintage condition with only light wear commensurate of age and honest use. There is a small spot of enamel missing to the top of the cased feature. This is on the back edge and is not very noticeable. Both mirrors are still nice and clear, with no chips or cracks. There are minor small spots of discolouration around the edges of the hand mirror. Please see the close up photo provided. 15.5 by 10.5cm with a 4.7cm depth. 10.5 by 8.0cm with a 2.0cm depth. UK. This box will posted FREE within the UK by Royal Mail Next Day Special Delivery. No International postage. We are sorry but we cannot offer international postage on this box, due to its large size and structure.